Founded in 1987, Yow Song Injection Molding Co., Ltd. is engaged in making silicone rubber products, with advanced extruders and hot-extrusion-molding machines. 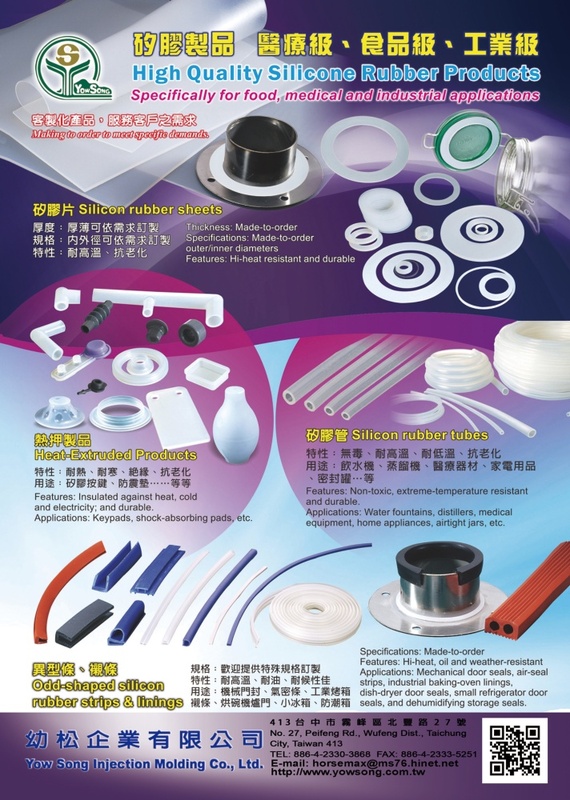 Designed for medical, food and industrial applications, our products include silicone rubber hoses (for medical instruments, drinking-water dispensers and electronics), air-seal strips, gaskets (for airtight jars and cosmetic bottles), irregularly-shaped strips (for doors of dish-dryers, dehumidifying storages, and machinery), and hot-extrusion-molded items (including suction cups, keyboard keys, gaskets, clothes-iron rests, and electronic shock-resistant/heat-insulation pads). Contac us for more information. Company name: Yow Song Injection Molding Co., Ltd.